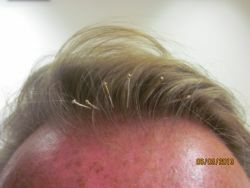 Scalp acupuncture is closely associated with the channel system using therapeutic points on the head, scalp, or both, to prevent and treat illnesses by communicating with the entire body's anatomical system. The theory of channels and network vessels are the pathways in which Qi and blood circulate. The system of channels and network vessels on and in the head reflect symptoms and signs in the brain, transmit needle sensations, and regulate the conditions of deficiency/xu or excess/shi in the central nervous system. Sessions are provided in a chair or bed depending upon specific needs and range anywhere from 30 to 45 minutes. It is recommended that patients rest in the clinic for 10 to 15 minutes after their treatment as areas on the scalp may be tender. If possible, it is advisable to relax for the remainder of the day.